‘Perfect Timing Skivvy’ marled sweatshirt from MINKPINK. 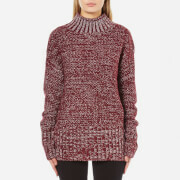 Crafted from a chunky mélange knit with contrast fleck detailing, the jumper comprises an oversized ribbed knit turtleneck, long sleeves and a banded hem. Finished with side slit hems. 100% Acrylic Model is 175cm/5'9 and wears a size S.